Characteristics: Double glazing (35mm) with thermal and acoustic insulation properties, aluminum frames, use of designated, pre-planned parking area, no bottom guide. Bottom insulation with rubber seals. Basic Dimensions: 105mm for upper and lower aluminum profiles, aluminum track size of 60x53mm or 75x72mm, 52mm total width of intermediate vertical aluminum frame. The F4-Elite folding glass doors system is a high-performance system, designed specifically for cold climates and generally demanding environments. It is a more sophisticated version of the F4 system, offering even better sound insulation and lower thermal conductivity. It consists of double-glazed panels, framed with aluminum profiles for extra insulation and durability in demanding environments. The vertical profiles of the aluminum frames are designed with a male/female cross section logic, so that they fit with each other perfectly, leaving no intermediate gaps. The bottom aluminum frames have rubber seals to ensure a completely airtight and watertight result. The horizontal aluminum profiles also have rubber seals that guarantee a tight fit. An additional aluminum profile is installed between the wall and aluminum panels for even better insulation and a better aesthetic result. On every frame, a lock mechanism is installed at about the height of 1m - so that the user avoids bending down to secure the panel with floor locks. Each pane can be turned into an opening/divertible door, used as an entrance once a roof spring mechanism is fitted in. Such entrances can be both single and double winged, while an additional mechanism can be added to gently pull the wing back in position after opening. The available options of the aluminum guide are either standard type with a cross section of 60x53mm or heavy type with a cross section of 75x72mm, depending on the requirements of the project. In the case of standard guide, the panel size is restricted to 100cm in width and 260cm in height (the maximum weight per pane being 100kg). Respectively, in the case of heavy duty guide, each pane can reach up to 120cm in width and 320cm in height (the maximum weight per pane being 150kg). The panes use double glazing (35mm) filled with argon gas, equipped with high-performance membranes for even better sound insulation and low thermal conductivity. 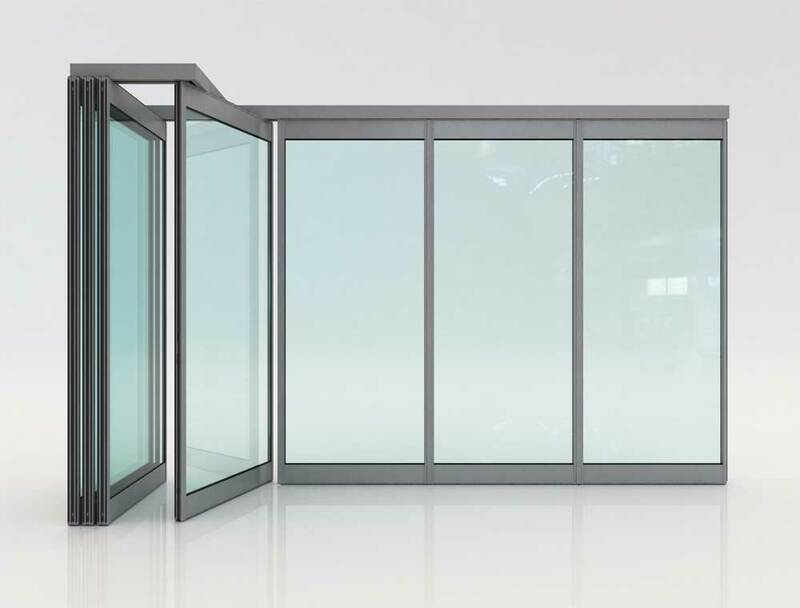 Double-glazing, folding door system with a wide range of applications, such as coffee shops, bars and restaurants, perimetric enclosure of exposed and unsheltered constructions (i.e. pergolas), entrance to hotels, indoor professional offices, libraries, conservatories and generally wherever sound and thermal insulation is a must. Thanks to its double glazing and overall thermal and acoustic insulation properties of its aluminum frames, the F4-elite system can dramatically increase the energy efficiency factor of the building. It is possible to add blinds inside the double glazing, to keep direct sunlight out. A proposal which may add an interesting touch to a design is the addition of horizontal aluminum profiles between the glazing, to create the image of split windows. Protection against outdoor conditions: Thanks to its double glazing, aluminum frames and bottom rubber sealing, a higher energy efficiency factor is achieved. Design Flexibility: : Total flexibility regarding the configuration of the parking area, as well as the number and dimensions of the panes. Elegant aesthetics: The F4-Elite folding door system maintains an elegant appearance, although it is designed to be a robust, high-performance insulation system.